Join us for a round trip through the Surrey Hills, an Area of Outstanding Natural Beauty. The grandeur and beauty of these hills embrace an amazing variety of countryside from rolling chalk downs and flower rich grasslands, to acid heaths and woodlands. Passengers travelling Premier Dining or Pullman Style Dining will be served a Champagne Brunch. 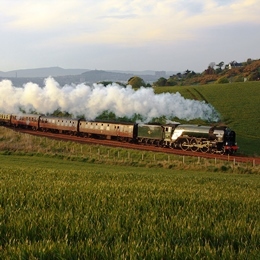 Fares for this tour start from £89 in Premium Standard, £139 for First Class, £189 for Premier Dining and £249 for Pullman Style Dining.